Listen to this track by Calgary-based folk-pop songcrafter Lauren Mann and her associated and moderately eccentric troupe the Fairly Odd Folk. It’s a cut as taken from their first record as a collective Over Land And Sea released in April 2013, and a single too; “I Lost Myself”. She was a charming presence on stage, and even more so when she presented this very song as a solo spot that captured everything that’s good about her music; heartfelt lyrics, melodic, and despite the acoustic and folky texture, decidedly pop too, all conveyed by her clear-as-a-bell voice, and deft playing. So, how did Lauren Mann come to appear on that stage, the largest of her career? Well, it has a lot to do with an important Canadian value; championing our own. And what does this song represent in all of that? We Canadians are a people on a quest. What are we searching for? Is it a Horatio Alger-style boot-strap pulling-derived sense of individual accomplishment? Well, not really. It’s more about figuring out what it means to be Canadian, and how to be Canadians together as a people. One of the places we’ve looked, historically speaking, has been driven by our arts and artists. This is currently under attack by our blinkered, belligerent, and ideologically-driven “Harper” government that seeks to run our country like a business that silences criticism by way of budget cuts, with everything being about bottom line thinking and without understanding the value of real culture in the long term, or even the short. But, that’s a whole other post. Our Canadian Broadcasting Corporation, also currently under attack by that self-same government and its minions, is our publicly funded broadcasting body at the heart of our quest. And more specifically when it comes to Lauren Mann & The Fairly Odd Folk, it is the vehicle to get our best and brightest into the spotlight through the CBC Searchlight contest, which this year, they won. Ironically, this was the song that got them there, a tale of losing focus on one’s passion as other aspects of life demand more attention. This could be the tale of any working musician. It’s nice when the story ends well, which it certainly did in this case. But, I think the thing that makes this such a Canadian story is not that we all lauded Lauren Mann for being on stage that day in front of the biggest audience she’d ever been in front of as if she’s on a level above us. We didn’t hold her up as an example of where the best of us could be if we worked hard enough. It’s that we were proud of her. We admired her work, because it is exceptional. But another aspect of this is that we enjoyed it because it was made by one of our own. You could feel that happening in the crowd; we were all on her side. 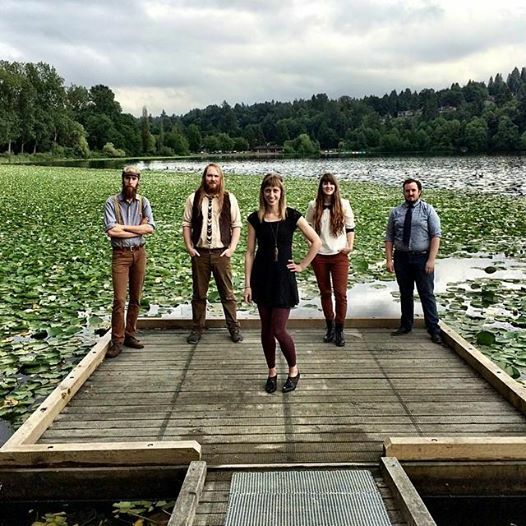 Lauren Mann & The Fairly Odd Folk at Deer Lake proper. The Canadian Dream, or better the Canadian Ideal is not like that of our American cousins in that respect. For us, it’s realized when we all succeed or even when one of us does in a way that we all can celebrate. The dream comes true when our individual stories add to the tapestry of what it means to live here as a people. And this song, along with the excellence of the whole record certainly proves the band’s quality, because it connects with that idea of the quest, and of momentarily losing our way as we all have done on quests of our own, but then finding it again with a little help from our (fairly odd) friends. But here’s another thing. As we were leaving the festival after the last song was played, the band flagged us down at the gate, giving us access to a free download of this album. They just wanted us to hear it, to spread it around to our friends, and play a small part in the quest talked about in this song. That’s as good an ending to the tale as any, because we all agreed to take part. In that moment, we really were in it together. You can learn more about this band at the Lauren Mann & The Fairly Odd Folk official site. Among other bits of news you’ll find there at the time of this writing is their plans to release a follow-up to Over Land And Sea. You can also join them on Facebook and get the skinny on the upcoming record, and their recent tour going on right now! Amen brother! Takes me back to how I felt when Joni Mitchell was scuffling through little folk clubs, knowing the rest of the world would worship her someday. Neil Young too. Cockburn, Cohen, k.d.lang. Thank god for the CBC and all those great radio programmes over the years! The CBC is a vital channel for artists to connect with new fans and vice versa. Sometimes, I think we take it for granted. But, it is such a powerful means for a country as large as ours to tell stories that bring us together as a people. I just wish our government felt the same. Rob thanks for this excellent article. I’m a huge fan of this group originally found them on CBC when it played “Weight of the World”- went home reseearched them – liked them more then subsequently got to see them at the Black’s house concert in Calgary on July 4th – what a great group of people they are – hard-working, talented (very very), fun, energetic and genuinely humble – truly ‘foks’ and folks I really like! Thanks for your article. I used to love summer concerts at Deer Lake when I lived there – I wish I’d been there. It was a great day out, for sure. There really was a communal spirit on the day, and despite the soggy weather!